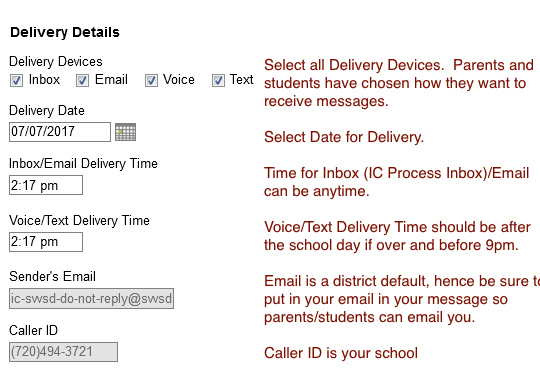 There are three message options available: Class Message (can be sent to both parents and students), Grades Message and Missing Assignment Message (these can only be sent to student contacts) To start either of the three messages click on New. The Delivery Device options determine how the message is delivered to the recipients. Different fields display for each device; all appropriate fields display if you choose more than one device. A dialogue box will open. You can save your messages by creating Templates. In the drop down under Message Type select which message to send. The User/User Group is where you can save your templates or find other templates. The groups listed depends on your job responsibility. Determine Delivery Devices, Delivery Date, Inbox/Email Delivery Time and Voice/Text Delivery Time. This area is for the email. This area is for the Text Message. Click Save or Save As if you’re modifying or creating a template. The Delete option also applies to templates. Click Test to view your message as recipients would see it. Click Next to move on to the next step of sending the message, which is determining recipients. Click Cancel to exit the message without sending. In this example I’ve clicked on Next. The second step of sending a message is selecting which students and/or messenger contacts to include in the recipient list. Class messages can be sent to multiple sections at a time, either to the entire section or specific individuals. To send a message to All recipients from section(s), choose that option and select the section(s) to include from the list of your sections, divided by term. Check the Recipients, at the bottom, either Student Messenger Contacts and/or Student. To choose Specific recipients from section(s), mark that option to view a list of recipients by section. Add recipients, sorted by Student Messenger Contacts or Students, from the selected section. Recipients can be added from either or both lists. 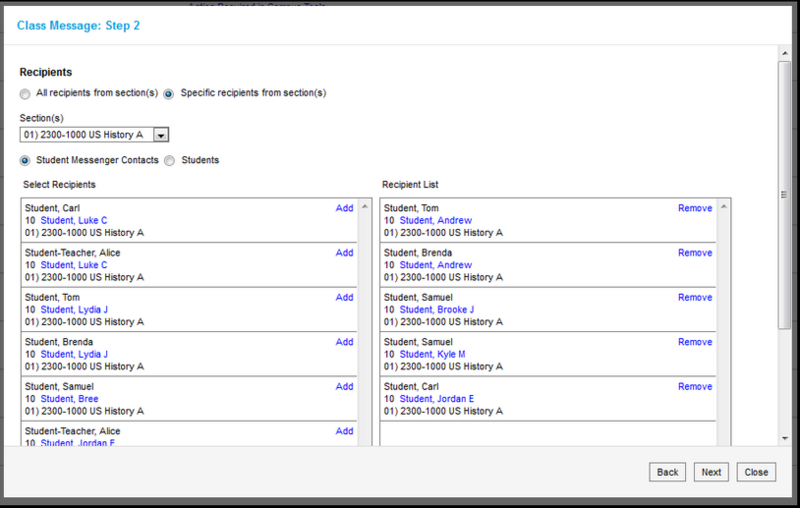 Select additional sections if desired; the Recipient List can include students and/or contacts from multiple sections. The final step of creating and sending a message is to review recipients and send the message. Those who had email addresses or phone number in Census with the appropriate messenger settings who received the message through those methods (Email and Voice/Text). The Message Preview displays all messages that will be sent to recipients. To review specific recipients, click Review Recipients. To remove a recipient prior to sending the message, or to remove a delivery device, unmark the checkbox next to the individual or any of their message devices. For example, in the image below that includes all guardian contacts and students for a section, one parent has two students in the course; unmark one of the duplicate recipients to prevent repeated messages. Click the student’s name to view their summary. 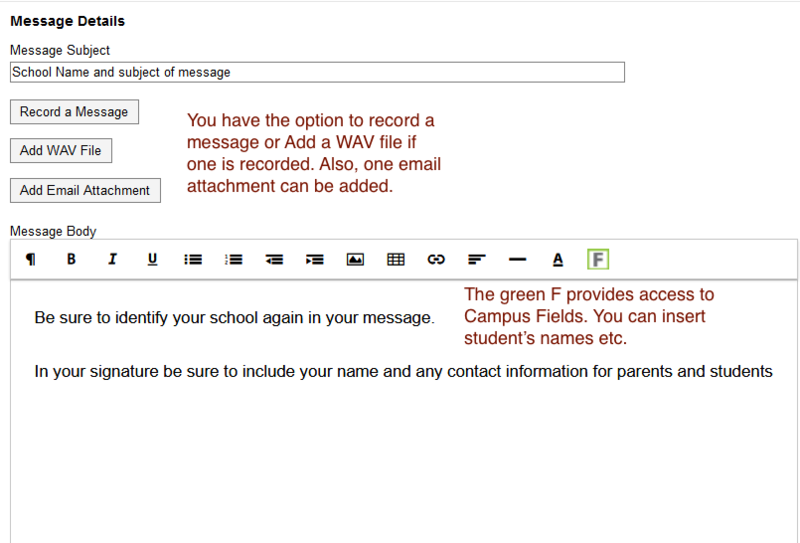 Click Preview to view the message as that parent would see it, with the appropriate Campus fields populated. Recipients who do not have any devices listed below their names (such as email addresses and phone numbers) will not receive the message. If you’ve made any changes to this screen, click Save and then Close to return to the preview screen. Otherwise, click Close to return.